Many people only consider camping out in the height of summer, when the UK brings it’s warm(er) evenings, clear(er) skies and a (slightly) reduced chance of rain. The majority of us are ‘fair-weather’ campers, mostly for fear of a miserable night being cold and wet. But it doesn’t have to be that way. Over the years, we’ve carefully researched and chosen our gear to be able to cope with almost any scenario you could throw at us. But you really don’t need it all, and it doesn’t have to be expensive. And, yes, camping in the middle of winter can be just as much – if not even more – fun than camping in winter. We’re going to try give winter wildcamp novices a slightly better insight into this wonderful pastime by sharing a few of our crucial bits of kit, some of the ways we make the most out of a weekend, and a couple of our experiences from this season. 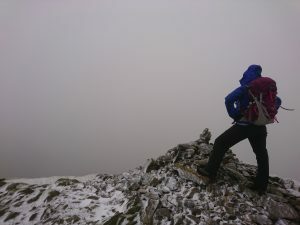 Kit is generally the thing that can make or break any outdoors adventure, and in some cases, lead to the good people of local Mountain Rescue Teams giving up their own time in order to help or save others. Tent. Bivvys are fun, but in winter we like to be fully protected from the elements. Waterproofness is key here, and ensure that you can carry your tent in and out of your camping spot on your rucksack. That is, weight definitely has an effect here! Sleeping bag, with a liner if you need that extra layer. It is crucial to get a decent sleeping bag: 3 to 4 season in particular if going out in the winter. Down sleeping bags are generally more expensive, but are lighter and also pack down smaller, so make carrying all your essentials a lot easier. The major disadvantage is that down clumps together when wet, which is not ideal for UK conditions. Instead, we use a fully synthetic bag which keeps its warmth a bit better when it gets wet, with a cotton liner for any extra cold nights. Roll mat. Self inflating mats can be a good compromise between size, cost, comfort and insulation. Fully inflatable mats (purely air), although packing down small, are usually a bit colder and a lot more expensive, whilst standard foam mats can often be uncomfortable and don’t provide quite as much insulation, although are often the cheapest solution. Headtorch, First aid kit and whistle. Standard. This little lot goes without saying. Extra batteries are a very good idea too. We tend to split our gear up into drybags within our rucksacks. This helps keep things dry, whilst easily recognisable and ‘grabbable’. as you can colour code different groups of items. Maps. Always take a physical map with you, and know how to read it! If you are camping, phone and GPS batteries can run out, and it’s important to have a phone with a battery for worst case scenario – calling for help! Water and snacks. Trekking in the hills is no easy feat. Make sure you can remain hydrated and have the right foods to fuel your body for the work you are putting it through. Extra layers. The forecasts are purely predictions – always take them with a pinch of salt. 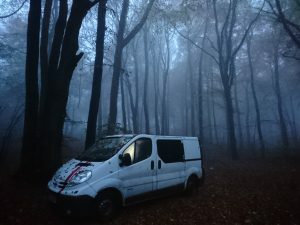 Further to the above, our DIY van conversion has helped with many a day out, and even more nights. Acting as a backup ‘hotel’ in case of an unexpected change in weather conditions or energy levels, although not everyone may own a van, make sure you have a back-up plan in case things don’t turn out like you expected. Car-camping is not as bad as it may seem! Being located in the Midlands, we have a pretty good selection of locations within a few hours drive from home. Our favourite place to get away is definitely Snowdonia, but we ultimately we just love getting out wherever we can. 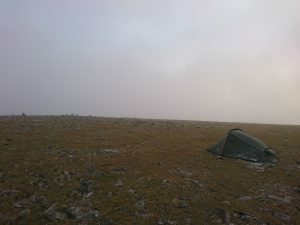 This year we have already managed a few wild camps, but they usually start off the same way. We do our best to have both the van and our bags fully packed the night before our trip, allowing us to start the adventure as soon as we skip out of work on a Friday. It makes a huge difference being able to drive straight from work to the starting point of your walk, and head off straight away. Alternatively, being less organised also has its upsides – arriving home, having dinner and then packing means that most of the rush hour traffic has dispersed, leaving a stress free journey. We have been known to mix and match these two tactics – sometimes out of choice or circumstance, and sometimes because we only decide where to go a few hours before hand. Make sure you try different things and work out what is best for you. If you are not used to night navigations, make sure your first few times are easy, obvious routes that you are familiar with. This way if you wander off track you can work out how to get back to the route, or worst case, pitch your tent and wait until morning. In mid-November, we were extremely excited to head up to the Lake District to attend the annual brilliance of the Kendal Mountain Festival. A weekend packed with films, talks, suppliers and demos, it is an outdoor-person’s dream. Due to other commitments, we hadn’t managed to pack properly earlier in the week. 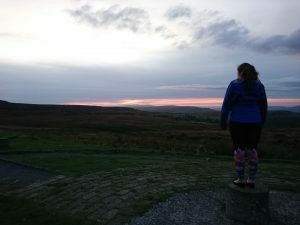 A few road closures and stopping for a leisurely dinner meant that we didn’t reach Wythburn church car park (our starting point on the A591) until about 10.30pm. We love night navigations, with just a spotlight hinting at what’s to come in the next few steps, and the extra challenge of keeping your bearings in the dark. Innocent animal noises in the undergrowth and glowing pairs of eyes staring back at you is one of the best medicines for letting go of a stressful week of work, whilst you continue to climb up towards the summit, uncertain of exactly how much further it is to go. Upon nearing the summit, the wind picked up and the wind chill became quite severe. At about 12:30AM, we decided to find some flatter ground to the south and pitch the tent as quickly as possibly, whilst ensuring to do everything properly (safety first!). 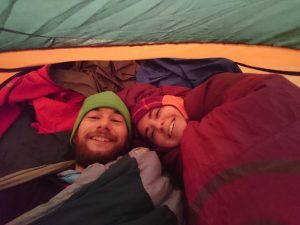 Having stopped walking, it was extremely important to get the tent up quickly and get ourselves out of the wind to ensure that we didn’t lose too much body warmth. The wind buffeted the tent for several hours before finally calming down at some unknown hour. A couple of hours later, we awoke to the patter of sleet on the tent sides. That morning was a moment we will never forget – having the cloud lift before us and revealing the rest of the mountains around us is one of the moments that make you say ‘this is why we do it’. Mid-January was a close friend’s birthday, and what better way to celebrate a birthday than a wildcamp near Glyder Fach in Snowdonia. From the forecast we were all excited about the winter conditions we might find, and it didn’t disappoint. Beginning straight from work on the Friday as usual, the walk up was a beautiful scramble in the dark above Llyn Ogwen, in search of Llyn y Cwn, our campsite for the night. At times, the snow – becoming worse the higher we climbed – and rocky path up made navigation a fun challenge, with each of us taking equal responsibility for the safety of the group amongst the friendly chatter. Reaching Llyn y Cwn, our communication stopped being as chatty as we navigated the frozen edges of the lakes, searching for a sheltered spot, found nestled amongst some large boulders on a flat. Again, the tents came out quickly to save us from the cold, and we promptly got into our sleeping bags and fell asleep in the comfort of the soft snow beneath us. Morning visibility was bad but didn’t hinder spirits. 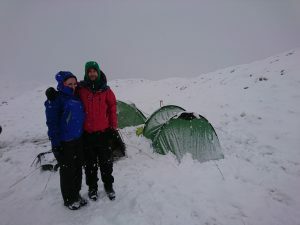 Our tents were now mini snowdrifts and everyone had slept well after the fun scramble up to the lake. A quick spot of breakfast and the tents came down again, and we descended back towards the Ogwen valley out of the cloud. As we lowered, visibility improved and the beauty of Snowdonia living up to its name meant that we all came away rosy-cheeked and very happy with the weekends adventure. Simple, but always worth it. With the aim of wildcamping a total of 25 times over the course of 2018, we hope to see more of you out on the hills in the near future. It doesn’t have to be complicated or difficult. For us, some of the best wildcamps are the easiest and the simplest, such as those we have described above. There really is nothing like the feeling of getting back to nature and wildcamping in winter!